What is a digital video file? 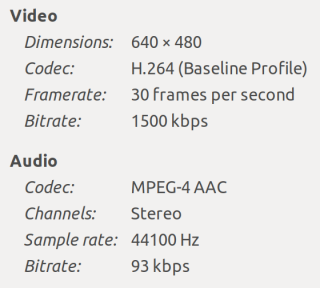 Understand the basics of digital video, including framerate, number of planes and bitrate. Please spend one minute to introduce yourself in the digital pad we will use during the workshop. For researchers interested in studying humans and human motion, a regular video recording is often the easiest, fastest and cheapest solution to start with. Nowadays, everyone has access to fairly high quality video cameras even in their mobile phones, and the cost of professional-quality video cameras is also within the reach for many researchers. One of the positive things about video analysis is that it opens for a broad range of analysis techniques, from purely qualitative methods to purely quantitative. For example, having a video recording that can be played back multiple times, and at various speeds, is very useful for visual inspection. And, as we shall see later, even a regular video recording can be used to extract meaningful quantitative motion data. Furthermore, it is also common to use video recordings as a reference when recording motion with sensor-based motion tracking technologies. In such cases, the video recording can be used to help the qualitative interpretation of numerical results. What is a video file? Let us start by understanding more about what a video file contains. Find a video file on your computer, for example the file dance.avi from the example folder. On most systems (Linux, Mac, Windows) you should be able to see some basic information about the video content by selecting something like “properties” from the file inspector. What type of compression is used? The important thing to understand here, is that a digital video file can be seen as a series of still images. This opens for doing various types of mathematical operations on the file. Here we can see the dimensions (640 pixels wide, 480 pixels tall) and framerate (30 frames per second). The properties of the video file described above above, shows that the video stream has been compressed with the H.264 standard. This is the most common video compression codec these days. It is a lossy codec, meaning that it throws away lots of data when it compresses the file. The H.264 standard is also a time-based compression codec, meaning that it compares frames over time, and only stores the information that change between so-called keyframes. This is an efficient way of creating good-looking videos, but it is less ideal for analytical purposes. For analysis we often prefer to use MJPEG (Motion JPEG), which is a format that stores a complete image for each frame. This leads to larger video files, but faster and easier processing. When dealing with video files in Matlab, we have found that the good old .AVI container format is the most reliable. Matlab can handle other formats too, but .AVI files are the only ones that work on all platforms (Linux, Mac, Windows). In a normal video file, each pixel is stored with a number between 0 and 255, where 0 means black and 255 means white. Colour files have four planes, while greyscale images only need one plane. One thing to bear in mind is that a video recording meant for analytical purposes is quite different from a video recording shot for documentary or artistic purposes. The latter type of video is usually based on the idea of creating an aesthetically pleasing result, which often includes continuous variation in the shots through changes in the lighting, background, zooming, panning, etc. A video recording for analysis, on the other hand, is quite the opposite: it is best to record it in a controlled studio or lab setting with as few camera changes as possible. This is to ensure that it is the content of the recording, that is, the human motion, which is in focus, not the motion of the camera or the environment. Foreground/background: place the subject in front of a background that is as plain as possible, so it is possible to easily discern between the important and non-important elements in the image. For computer vision recordings it is particularly important to avoid backgrounds with moving objects, since these may influence the analysis. Lighting: avoid changing lights, as they will influence the final video. In dark locations, or if the lights are changing rapidly (such as in a disco or club concert), it may be worth recording with an infrared camera. Some consumer cameras come with a “night mode” that serves the same purpose. Even though the visual result of such recordings may be unsatisfactory, they can still work well for computer-based motion analysis. Camera placement: place the camera on a tripod, and avoid moving the camera while recording. Both panning and zooming makes it more difficult to analyse the content of the recordings later. If both overview images and close-ups are needed, it is better to use two (or more) cameras to capture different parts of the scene in question. Image quality: it is always best to record at the highest possible spatial (number of pixels), temporal (frames per second) and compression (format and ratio) settings the camera allows for. However, the most important is to find a balance between image quality, file size and processing time. As mentioned earlier, a video recording can be used as the starting point for both qualitative and quantitative analysis. We will here look at a couple of different possibilities, moving from more qualitative visualisation methods to advanced motion capture techniques. Video: use MJPEG (Motion JPEG) as the compression format. This compresses each frame individually. Use .AVI as the container, since this is the one that works best on all platforms. Audio: use uncompressed audio (16-bit PCM), saved as .WAV files (.AIFF usually also works fine). If you need to use compression, MP3 compression (MPEG-1, Layer 3) is still more versatile than AAC (which is used in .MP4 files). If you use a bitrate of 192 Kbs or higher, you should not get too much artifacts. A video file contains a series of images, and each image is a matrix that can be operated on. A framerate of 25 fps means that there are 25 frames (images) per second. The bit rate tells about the variation of each pixel, an 8-bit image stores values from 0-255. A colour image uses 4 planes, Alpha, Red, Green, Blue, while greyscale only uses 1 plane.